One of the best ways to learn about a culture is celebrating the holidays. Students studying with UGACR in the fall have the chance to learn about the history of Costa Rica through participating in the celebration of Costa Rican Independence Day. Spanish professor Ana Ligia Lopez gave a fascinating presentation about how Costa Ricans have celebrated their independence in the past and now in the present. Costa Rica, and all of Central America, gained independence from Spain on September 15, 1821. Today people across the country celebrate with decorative lanterns the night of the 14th as well as a parade on the 15th. Students worked hard to prepare their own lanterns, or faroles, to carry the night of the celebration. Some chose to use the shapes of Costa Rica’s animals, such as a toucan or frog. Others focused on using the colors of Costa Rica’s flag: red, white, and blue. With lanterns ready, everyone headed down to the elementary school in upper San Luis where the community had gathered to sing the national anthem. At exactly 6 p.m. each year, Costa Ricans across the country begin to sing the national anthem. Before the anthem, students and children alike stood in line to have their faroles evaluated by a panel of judges. Many lanterns were shaped like typical Costa Rican homes or the traditional oxcart. You can learn more about why Costa Ricans use lanterns for this holiday from this article in the Tico Times. One of UGA’s students won a prize for her lantern made in the shape of a woman wearing a traditional Costa Rican skirt in red, white, and blue! After the lantern winners were announced, everyone walked along the road with the lanterns (and maybe a few flashlights) lighting the way. 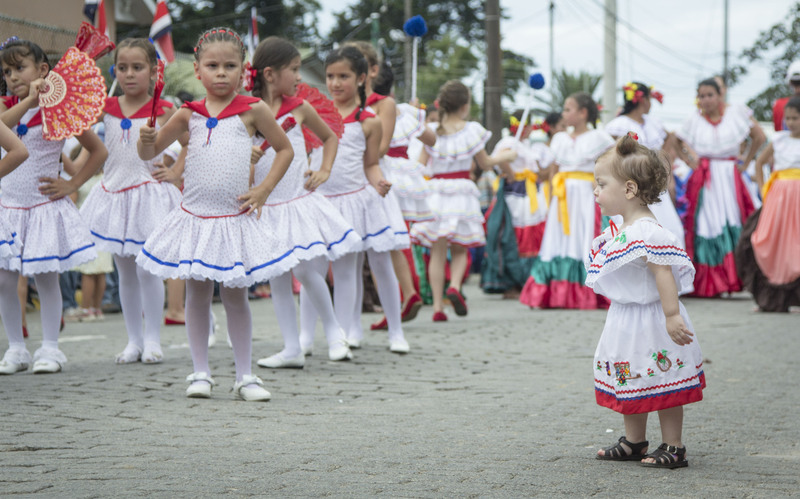 Another important part of the Independence Day celebrations is the parade through the town of Santa Elena with schoolchildren marching in costume and performances by dancers and marching bands. The atmosphere is festive and the colorful costumes make the scene even more lively.